Be featured as the opening act for the Russ Parr Bus Tour concert in the winner's local Russ Parr Bus Tour market; including the following cities: Cleveland, OH; Dayton, OH; Cincinnati, OH; Louisville, KY; Washington, DC; Indianapolis, IN; Raleigh, NC; Richmond, VA; and Fayetteville, NC. 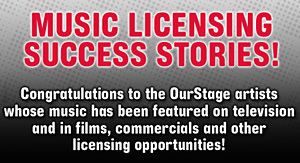 Accepted genres must fall into the following genre based categories on OurStage: Urban Channels including Hip-Hop, Alternative Hip-Hop, Rap; R&B Channels including R&B and Soul. Entries may also fall under the Gospel genre. Any musical genre that is outside the genres above will be removed from the competition. Artists must be a member of the following cities corresponding to each contest for the Russ Parr Bus Tour: Cleveland, OH; Dayton, OH; Cincinnati, OH; Louisville, KY; Washington, DC; Indianapolis, IN; Raleigh, NC; Richmond, VA; and Fayetteville, NC. There will be one (1) winner in each of the above-listed markets. Once an individual wins a prize in this Contest, they are not eligible to win an additional prize in a different market. Transportation to and from the concert venue will not be provided to the winner(s).